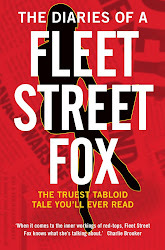 fleet street fox: "She knows... a lot... about... things." FOR those who wonder whether I exist, whether I am a man and if I'm capable of not swearing, here is proof that I do, I'm not, and I can sometimes. The very lovely Sadie and Sarah invited me onto their Sunday afternoon show on Chance Radio to do a little review of the weekend's papers. They were very kind and gave me a cup of tea and some biscuits, but we were all so busy having fun we forgot to record it. Luckily one of you did, and was kind enough to send it to me. Thank you Paul! So here it is, along with a telling-off for Richard Desmond, ranting about Jimmy Choos, a shameless plug and a bit of a rollocking for the Prime Minister. Having listened to it I've decided to not do silly voices ever again, and also to record things next time. Warning - this is a half-hour segment out of a one-hour show, with the music cut out so there's a few jumps and it's not complete. They introduce me then I'm on about ten minutes in.